This item will ship after June 25, 2019, or when made available by the publisher. Learn Dialectical Behavior Therapy (DBT) in a more flexible and creative way. 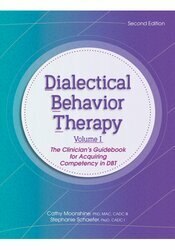 Filled with strategies to customize and adapt DBT to various settings, while still maintaining a dialectical balance, being mindfully present and making use of DBT skills. 16 clinical vignettes to practice skills learned. Dr. Cathy Moonshine is a licensed clinical psychologist, recognized expert in Dialectical Behavior Therapy (DBT) and an addiction specialist. She has over 30 years of experience in public, university, and private mental health and addictions treatment settings across all levels of care, serving as a clinician, supervisor and director. Dr. Moonshine has trained thousands nationally and internationally with creative methods and flexible thinking to show there is more than one model for successful DBT. Dr. Moonshine is the Behavioral Health Director at Hawaii Island Family Medicine Residency and Health Clinic at Hilo Medical Center on the Big Island of Hawaii. She is a professor emeritus at Pacific University in Oregon. Dr. Stephanie Schaefer is a licensed psychologist and certified alcohol drug counselor I in Portland, Oregon. She has worked with clients from a variety of backgrounds and in various settings, including both outpatient and residential community mental health settings. In addition, Dr. Schaefer has provided DBT and co-occurring disorders trainings regionally, nationally, and internationally, and mentors colleagues and supervises graduate-level practicum students. Dr. Schaefer is a faculty counselor at Clackamas Community College, where she has the opportunity to teach and utilize DBT skills regularly.